Feel free to the hit that "INTERESTED" or "GOING" button to get up to date event info and etc. Event is free and family friendly. It's time for another fun STR(Scale Trail Run)! We hope to see you there! If your new to the crawling hobby, bring what you have and we will find you a class to run in, you will not be turned away, we're extremely welcoming to new folks. This is the first "Scale Trail Run" event for the 2019 series, with 6 totals events in the year long series. 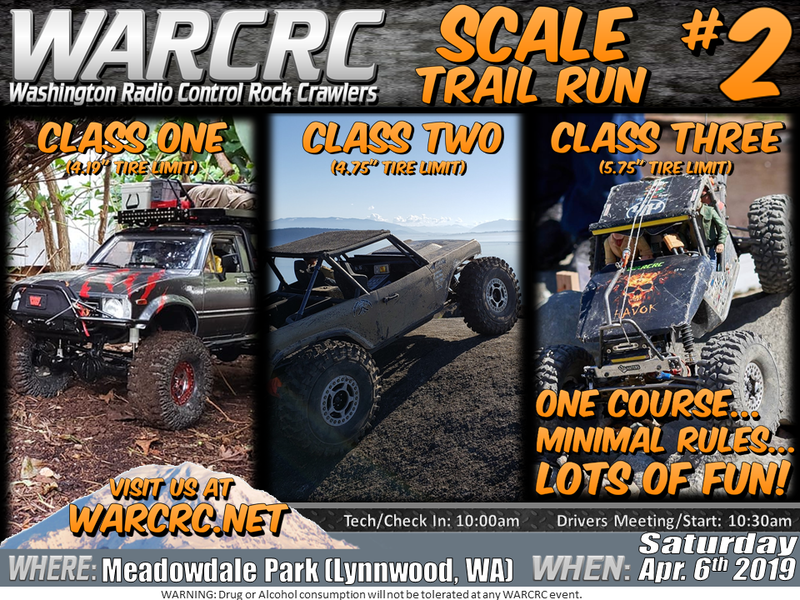 We alternate each month this a "Scale Trail Run" event and a "Scale Comp" event. Next month with be a "Scale Comp". A “Scale Trail Run” is an event with minimal rules and created to maximize fun. This event only has a single course with 40 gates to progress through, a new driver is released on the course every 5-10 mins with a judge following them recording penalties, +5 for a roll over and +10 for each gate hit. Class One(SORRCA) trucks will go first, followed by Class Two and then Class Three. Winner is determined by least amount of penalties and ties are broken per who has the fastest time. This event is to mimic the all popular "King of the *ammer" race.
) or come to a scale comp to help determine which class your truck falls under. We don't turn anyone away, come join in on the fun.